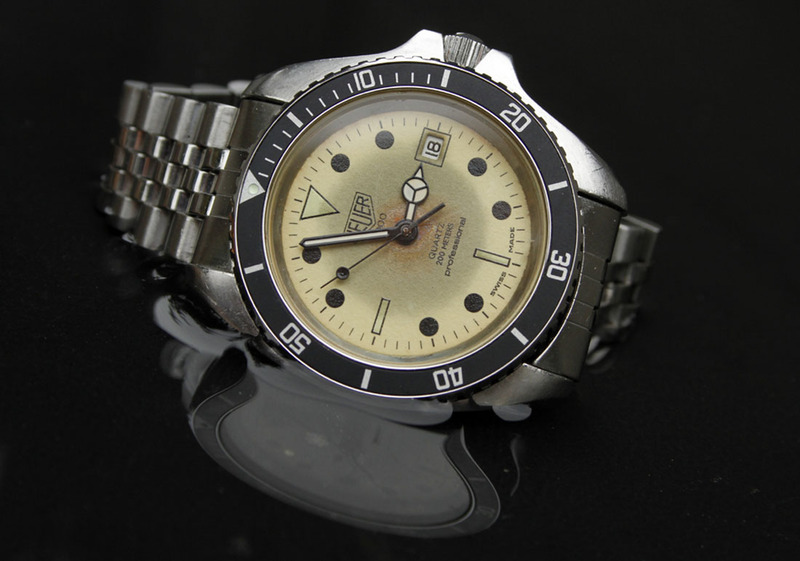 1980s Heuer 980.032 L after restauration. I started with a non running basket case missing it's bezel. I had to find a replacement vintage ESA movement (not easy). The original movement was rusted solid. No chance to make it running again. I found the right movement and swithed the name plate so the new movement was signed Heuer. Then I had to get new minute and hour hands, the original was rusted to pieces. I got hold of two new ones of the black correct type. Problem was that the lume was way to white. 20 minutes in the kitchen oven at 200 C and a quick dip in coffee made the lume match the dial perfect. A NOS bezel was next part missing. I got one throught Chronotrader, I had one for ref. 844, and traded it for the one I needed. At last I put on a jubilee bracelet, and the watch was ready for use again. I think a sad looking basket case bought very cheap on Ebay turned out to be a nice classic Heuer in the end. good job bro + very nice!! !